Death Comes for the Archbishop is a breath-taking fictionalized account of the founding of the Archdiocese of Santa Fe, New Mexico through the story of Jean Marie Latour, a French missionary who eventually becomes the first bishop (later archbishop) there. The story begins in medias res with Latour already appointed but forced to travel to Durango, Mexico, in order to gain recognition from the bishop there after the New Mexican priests revolt. Latour’s story is one of recognizing the passing joys of life and the deep friendship with his fellow missionary Joseph Vaillant who comes with him from France to Ohio to New Mexico before they are finally separated. 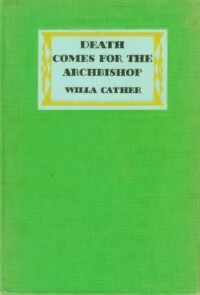 Because a bishop is required to visit the parishes under his jurisdiction as part of his position the reader is treated to a series of interesting figures whose individual stories show the variety of ways man both falls down and manages to flourish. The actual story of how Latour arrived at his position in New Mexico from a humble beginning in rural France is not told until the last third of the book, when dead is clearly coming and the old Archbishop’s mind begins to wander back. Cather’s storytelling here is excellent, and the Southwestern landscape comes alive under her pen. This is a non-religious story about religious people, almost a parable for a good life, so the fact that it’s about an archbishop shouldn’t frighten off those afraid of religious fiction. It’s historical fiction, the real Latour was Jean Baptiste Lamy, whose life is documented in Paul Horgan’s excellent Lamy of Santa Fe, which won the Pulitzer for History in 1975. Overall, a book highly recommended for those looking for a good story or interesting in the American Southwest. A classic that is not only readable but that should be read.